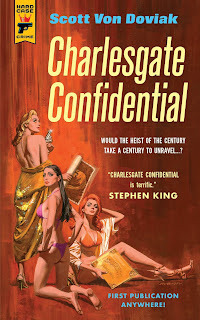 The overall plot and characters are pure pulp noir detective stuff and this is a very good thing. There’s the gangster criminals, the hack journalist, the tart with a heart, corrupt cops, satanic rumours, illicit liaisons, you name it, it’s in here, and that’s before we even get to the crime and its investigation. And yet it doesn’t feel cliched at all. All the characters have their purpose and nobody feels shoe-horned in just to tick a box or just for the sake of a plot point, they all makes sense. But there’s one character that runs through all three of the story strands that stands out for me and that is the Charlesgate itself. From the building’s beginnings as a high class hotel, through its run-down years where it saw organised crime, brothels and casinos run from its rooms, to being turned into student dorms and then back into high class condo apartments, it’s a building that lives and breathes through the eras, you can see and feel the changes happen and just imagine the secrets the walls hold, especially those on the 8th floor that doesn’t exist on the outside. 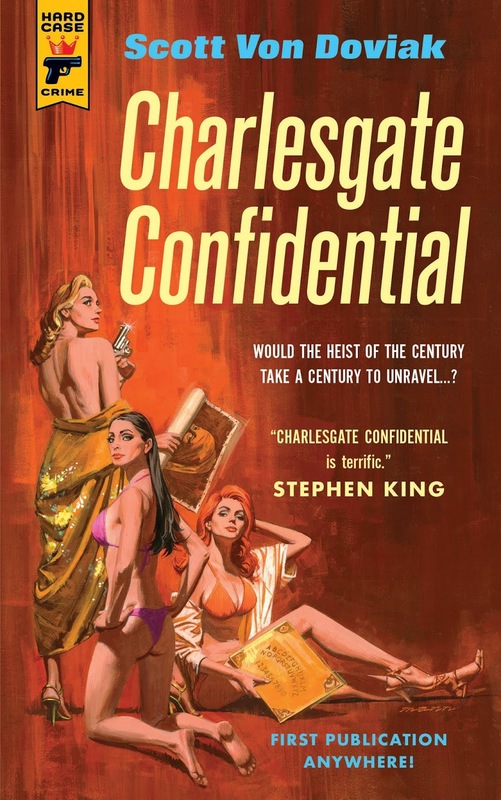 Charlesgate Confidential is as fast-paced and violent as you would expect from a good pulp thriller but there’s also a credible (and incredible) decades spanning in-depth investigative story, full of twists and turns, with a level of intelligence to the writing that hooked me from the start. It’s unbelievable that this is a debut novel because it’s so amazingly well thought through, planned and executed to perfection, giving it a refinement that few experienced crime writers can achieve. That said, I’m going to have to read the book again to check something, just for my own satisfaction, because I’m weird like that. You see, the way the story is laid out in the book, you get one chapter from the 1946 story, the next is from 1986 and the third is from the 2014 investigation and thus it cycles throughout the book. First read through I did was sequential, as you do – page 1 to the end, and this works brilliantly. I got so much from the tiny tie-ins between the timelines in the separated chapters that revealed themselves as the book goes on, those satisfying little “aha” moments in thrillers that you get just before a cliff-hanger. But now I want to go back and see how the stories stack up if I read them chronologically instead – all the 1940’s chapters, then all the 1980’s chapters and finally the 2014 chapters. If this works as I expect it should do, given the high standard of forethought the book already has, then TV companies take note, you could have a three-season epic show on your hands. Snap it up now.